Floodlights, Wolf Warriors and Mike’s Wellwoman are champs. The Hadi’s / City Mall Softball tournament climaxed last Saturday at the Ministry of Education ground on Carifesta Avenue, and was well attended. The game started at 11:00am and ended under lights as Floodlights, Wolf Warriors and Mike’s Wellwoman were victorious in their respective categories. Results: Male Over 40- 20/20: Floodlights vs Success Masters. Success Masters 161 all out in 19.3 overs. Khemraj Baljit 51. Baldeo Muller 36. Ramchand Ragbeer 4 for 26. Floodlights 162 for 4 in 16.2 overs. Man of the Match Wayne Jones 57 not out. Ricky Deonarine 29 not out. Male Open 15/15: Wolf Warriors defeated Regal by 4 wickets. Regal 117 all out in 14.4 overs. Patrick Rooplall 28. Richard Latiff 27. Man of the Match Asif Safee took 3 for 11. Wolf Warriors 119 for 6 in 13 overs. Safraz 28. Ameer Nizamudeen 13 not out. Doran and Devanand Persaud took 2 wickets each. Female 10/10 finals: Mike’s Wellwoman defeated Karibbe Rice Strykers by 8 runs. Mike’s Wellwoman 80 for 6 off 10 overs. Joan Vansertima 25 not out. Akase Thompson 11. Karibbe Rice Strykers 72 all out in 9.3 overs. All victorious teams each received $100,000.00 and a trophy. Runner-ups each received $50,000.00 and a trophy. Man of the Match received $10,000.00 and a trophy. 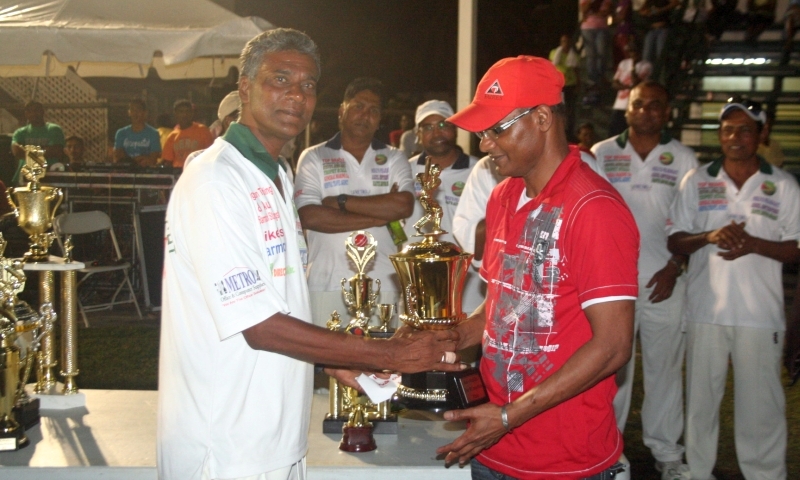 Players of the Series were Ricky Sergeant for Male Open, Zola Telford for Female and Toolsie Sahadeo for the Masters. They each received $10,000.00 and a trophy. The tournament began on January 22,2012, and was organised and managed by Guyana Floodlight Softball Cricket Association (GFSCA).